German police say a fire at a zoo in the western city of Karlsruhe has killed 26 animals. The blaze on Friday night destroyed the petting zoo - a number of wooden buildings housing Shetland ponies, sheep, goats and a llama. Around 100 firefighters fought strong winds to put the fire out and stop it spreading to neighbouring buildings. Staff managed to evacuate all the wild animals safely, although one elephant suffered slight burns. The zoo's director, Gisela von Hegel, said that when she was called out, she could see that the petting zoo buildings were engulfed in flames. "There was no possibility to rescue the animals from there because the roof had already collapsed, so it would have been too dangerous." She said she then worked on plans to free the elephants, flamingos and hippos who were in nearby enclosures. An investigation is under way into the cause of the fire. 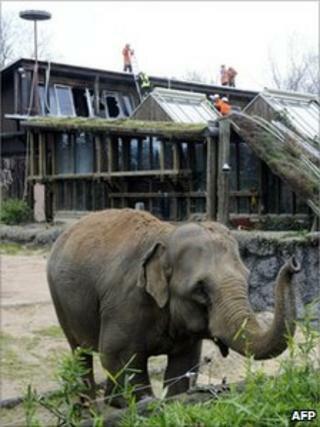 Authorities said that, apart from the petting enclosure, the zoo would be open for business as usual on Sunday.